While setting up your live channel is easy, the encoder setup page is admittedly the most challenging step. Please note that DaCast does not support adaptative live transcoding yet, but we soon will! At this point, DaCast uses a multi-bitrate method for live video. This method allows the broadcaster to setup several different qualities at which to stream content. Please note, also, that our player is adaptive and automatically detects your encoder multi-bitrate settings. In this way, we can provide the best quality stream to your viewers based on their individual connections. 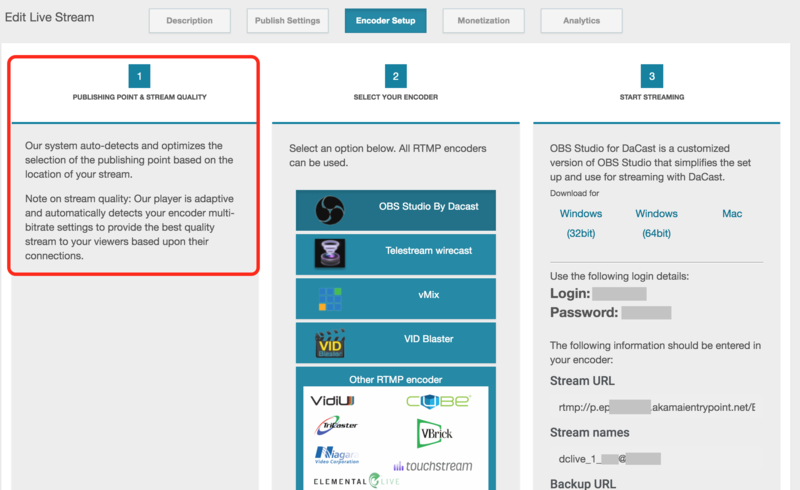 OBS Studio: an open broadcaster software that you can use to freely and easily set up your stream. This version has been customized to offer you an easier and faster set up. VMix: a paid encoder for Windows (free 60 day trial). VIDBlaster: a paid encoder for Windows (free demo available but your broadcasts will contain video watermarks). When choosing a setup option, make sure your KeyFrame interval is 2 seconds (and nothing else). This step contains the information you need to enter in order to connect your encoder to your DaCast live channel. Note: Stream URL and Stream names are always needed. If you are having trouble using the Stream URL, you might consider using the Backup URL. Some encoders have only one URL field. 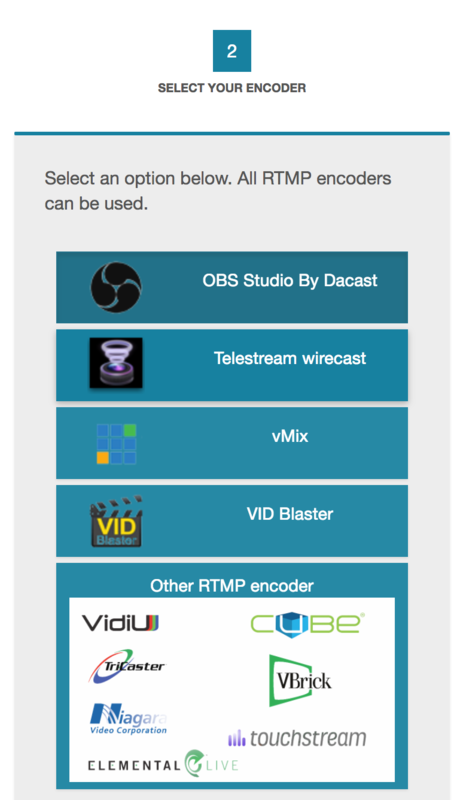 If this is your case, please go into the “Other RTMP encoders” (step 2). Once there, click on the link below the back-up URL to access a full URL. The full URL is a combination of the Stream URL and the stream name. Note: Login and Password are needed when DaCast is not integrated into the drop-down menu of the encoder. When DaCast is available in the drop-down menu, you can log in to your account directly with your DaCast credentials. Have you talked to our online chat support? That would be great to give them screenshots of what you’re not able to see!